In the same article, Bruce also made a mea culpa regarding his recent decision to sell a new Greatest Hits package exclusively at Wal-Mart. For those who were more interested in the ads than the game (Steelers won 27-23), Hulu has all of the ads archived over here. 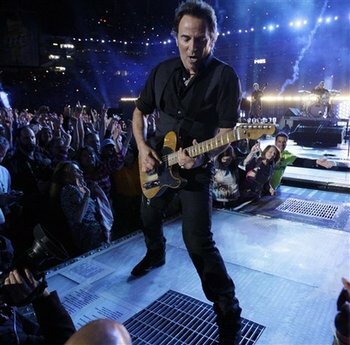 Video of the Boss’ 12 minute halftime performance after the jump (while it lasts). Tickets for Bruce’s 2009 tour go on sale today (Feb 2). The highlight is in video #1 at about 3:25 when he finds out how slick the stage surface is and slides into the camera. It was also kind of funny when his tech almost dropped his guitar at the beginning.